The symptoms of asthma, which can range from mild to life threatening, can usually be controlled with a combination of drugs and environmental changes. Public attention in the developed world has recently focused on asthma because of its rapidly increasing prevalence, affecting up to one in four urban children. आज्मायागु एक्युट एट्याकयाट आज्मा अट्याक धाई। थन्यागु अट्याकयागु हलमार्क डिस्प्निया व व्हीज वा स्ट्राइडरय् छगु जुइ। Although the former is "often regarded as the sine qua non of asthma," some patients present primarily with coughing, and in the late stages of an attack, air motion may be so impaired that no wheezing may be heard. When present the cough may sometimes produce clear sputum. The onset may be sudden, with a sense of constriction in the chest, breathing becomes difficult, and wheezing occurs (primarily upon expiration, but can be in both respiratory phases). Signs of an asthmatic episode include wheezing, rapid breathing (tachypnea), prolonged expiration, a rapid heart rate (tachycardia), rhonchous lung sounds (audible through a stethoscope), and over-inflation of the chest. During a serious asthma attack, the accessory muscles of respiration (sternocleidomastoid and scalene muscles of the neck) may be used, shown as in-drawing of tissues between the ribs and above the sternum and clavicles, and the presence of a paradoxical pulse (a pulse that is weaker during inhalation and stronger during exhalation). During very severe attacks, an asthma sufferer can turn blue from lack of oxygen, and can experience chest pain or even loss of consciousness. Just before loss of consciousness, there is a chance that the patient will feel numbness in the limbs and palms may start to sweat. Feet may become icy cold. Severe asthma attacks may lead to respiratory arrest and death. Despite the severity of symptoms during an asthmatic episode, between attacks an asthmatic may show few signs of the disease. ≥२०% decrease in peak flow following exposure to a trigger (e.g., exercise). In many cases, a physician can diagnose asthma on the basis of typical findings in a patient's clinical history and examination. Asthma is strongly suspected if a patient suffers from eczema or other allergic conditions—suggesting a general atopic constitution—or has a family history of asthma. While measurement of airway function is possible for adults, most new cases are diagnosed in children who are unable to perform such tests. Diagnosis in children is based on a careful compilation and analysis of the patient's medical history and subsequent improvement with an inhaled bronchodilator medication. In adults, diagnosis can be made with a peak flow meter (which tests airway restriction), looking at both the diurnal variation and any reversibility following inhaled bronchodilator medication. Testing peak flow at rest (or baseline) and after exercise can be helpful, especially in young asthmatics who may experience only exercise-induced asthma. If the diagnosis is in doubt, a more formal lung function test may be conducted. Once a diagnosis of asthma is made, a patient can use peak flow meter testing to monitor the severity of the disease. In the Emergency Department doctors may use a capnography PMID 16187465 which measures the amount of exhaled carbon dioxide along with pulse oximetry which shows the amount of oxygen dissolved in the blood, to determine the severity of an asthma attack as well as the response to treatment. Before diagnosing someone as asthmatic, alternative possibilities should be considered. A physician taking a history should check whether the patient is using any known bronchoconstrictors (substances that cause narrowing of the airways, e.g., certain anti-inflammatory agents or beta-blockers). Chronic obstructive pulmonary disease, which closely resembles asthma, is correlated with more exposure to cigarette smoke, an older patient, less symptom reversibility after bronchodilator administration (as measured by spirometry), and decreased likelihood of family history of atopy. Pulmonary aspiration, whether direct due to dysphagia (swallowing disorder) or indirect (due to acid reflux), can show similar symptoms to asthma. However, with aspiration, fevers might also indicate aspiration pneumonia. Direct aspiration (dysphagia) can be diagnosed by performing a Modified Barium Swallow test and treated with feeding therapy by a qualified speech therapist. If the aspiration is indirect (from acid reflux) then treatment directed at this is indicated. A majority of children who are asthma sufferers have an identifiable allergy trigger. Specifically, in a 2004 study, 71% had positive test results for more than 1 allergen, and 42% had positive test results for more than 3 allergens. The majority of these triggers can often be identified from the history; for instance, asthmatics with hay fever or pollen allergy will have seasonal symptoms, those with allergies to pets may experience an abatement of symptoms when away from home, and those with occupational asthma may improve during leave from work. Occasionally, allergy tests are warranted and, if positive, may help in identifying avoidable symptom triggers. After a pulmonary function test has been carried out, radiological tests, such as a chest X-ray or CT scan, may be required to exclude the possibility of other lung diseases. In some people, asthma may be triggered by gastroesophageal reflux disease, which can be treated with suitable antacids. Very occasionally, specialized tests after inhalation of methacholine — or, even less commonly, histamine — may be performed. Asthma is categorized by the United States National Heart, Lung and Blood Institute as falling into one of four categories: mild intermittent, mild persistent, moderate persistent and severe persistent. The diagnosis of "severe persistent asthma" occurs when symptoms are continual with frequent exacerbations and frequent nighttime symptoms, result in limited physical activity and when lung function as measured by PEV or FEV1 tests is less than 60% predicted with PEF variability greater than 30%. There is no cure for asthma. Doctors have only found ways to prevent attacks and relieve the symptoms such as tightness of the chest and trouble breathing. During an asthma episode, inflamed airways react to environmental triggers such as smoke, dust, or pollen. The airways narrow and produce excess mucus, making it difficult to breathe. In essence, asthma is the result of an immune response in the bronchial airways. The airways of asthmatics are "hypersensitive" to certain triggers, also known as stimuli (see below). In response to exposure to these triggers, the bronchi (large airways) contract into spasm (an "asthma attack"). Inflammation soon follows, leading to a further narrowing of the airways and excessive mucus production, which leads to coughing and other breathing difficulties. Indoor Allergenic air pollution from Volatile organic compounds, including [perfume]s and perfumed products. Examples include soap, dishwashing liquid, laundry detergent, fabric softener, paper tissues, paper towels, toilet paper, shampoo, hairspray, hair gel, cosmetics, facial cream, sun cream, deodorant, cologne, shaving cream, aftershave lotion, air freshener and candles, and products such as oil-based paint. Medications, including aspirin, β-adrenergic antagonists (beta blockers), and penicillin. Food allergies such as milk, peanuts, and eggs. However, asthma is rarely the only symptom, and not all people with food or other allergies have asthma. Various industrial compounds and other chemicals, notably sulfites; chlorinated swimming pools generate chloramines—monochloramine (NH2Cl), dichloramine (NHCl2) and trichloramine (NCl3)—in the air around them, which are known to induce asthma. Early childhood infections, especially viral respiratory infections. However, persons of any age can have asthma triggered by colds and other respiratory infections even though their normal stimuli might be from another category (e.g. pollen) and absent at the time of infection. 80% of asthma attacks in adults and 60% in children are caused by respiratory viruses. Allergenic indoor air pollution from newsprint & other literature such as, junk mail leaflets & glossy magazines (in some countries). Hormonal changes in adolescent girls and adult women associated with their menstrual cycle can lead to a worsening of asthma. Some women also experience a worsening of their asthma during pregnancy whereas others find no significant changes, and in other women their asthma improves during their pregnancy. Emotional stress which is poorly understood as a trigger. The mechanisms behind allergic asthma—i.e., asthma resulting from an immune response to inhaled allergens—are the best understood of the causal factors. In both asthmatics and non-asthmatics, inhaled allergens that find their way to the inner airways are ingested by a type of cell known as antigen presenting cells, or APCs. APCs then "present" pieces of the allergen to other immune system cells. In most people, these other immune cells (TH0 cells) "check" and usually ignore the allergen molecules. In asthmatics, however, these cells transform into a different type of cell (TH2), for reasons that are not well understood. The resultant TH2 cells activate an important arm of the immune system, known as the humoral immune system. The humoral immune system produces antibodies against the inhaled allergen. Later, when an asthmatic inhales the same allergen, these antibodies "recognize" it and activate a humoral response. Inflammation results: chemicals are produced that cause the airways to constrict and release more mucus, and the cell-mediated arm of the immune system is activated. The inflammatory response is responsible for the clinical manifestations of an asthma attack. The following section describes this complex series of events in more detail. The fundamental problem in asthma appears to be immunological: young children in the early stages of asthma show signs of excessive inflammation in their airways. Epidemiological findings give clues as to the pathogenesis: the incidence of asthma seems to be increasing worldwide, and asthma is now very much more common in affluent countries. In 1968 Andor Szentivanyi first described The Beta Adrenergic Theory of Asthma; in which blockage of the Beta-2 receptors of pulmonary smooth muscle cells causes asthma. Szentivanyi's Beta Adrenergic Theory is a citation classic and has been cited more times than any other article in the history of the Journal of Allergy. In 1995 Szentivanyi and colleagues demonstrated that IgE blocks beta-2 receptors. Since overproduction of IgE is central to all atopic diseases, this was a watershed moment in the world of Allergy. The Beta-Adrenergic Theory has been cited in the scholarship of such noted investigators as Richard F. Lockey (former President of the American Academy of Allergy, Asthma, and Immunology), Charles Reed (Chief of Allergy at Mayo Medical School), and Craig Venter (Human Genome Project). The study showed that children in the high ozone communities who played three or more sports developed asthma at a rate three times higher than those in the low ozone communities. Because participation in some sports can result in a child drawing up to 17 times the “normal” amount of air into the lungs, young athletes are more likely to develop asthma. Another theory of pathogenesis is that asthma is a disease of hygiene. In nature, babies are exposed to bacteria and other antigens soon after birth, "switching on" the TH1 lymphocyte cells of the immune system that deal with bacterial infection. If this stimulus is insufficient, as it may be in modern, clean environments, then TH2 cells predominate, and asthma and other allergic diseases may develop. This "hygiene hypothesis" may explain the increase in asthma in affluent populations. The TH2 lymphocytes and eosinophil cells that protect us against parasites and other infectious agents are the same cells responsible for the allergic reaction. The Charcot-Leyden crystals are formed when the crystalline material in eosinophils coalesce. These crystals are significant in sputum samples of people with asthma. In the developed world, these parasites are now rarely encountered, but the immune response remains and is wrongly triggered in some individuals by certain allergens. Finally, it has been postulated that some forms of asthma may be related to infection, in particular by Chlamydia pneumoniae. This issue remains controversial, as the relationship is not borne out by meta-analysis of the research. The correlation seems to be not with the onset, but rather with accelerated loss of lung function in adults with new onset of non-atopic asthma. One possible explanation is that some asthmatics may have altered immune response that facilitates long-term chlamydia pneumonia infection. The response to targeting with macrolide antibiotics has been investigated, but the temporary benefit reported in some studies may reflect just their anti-inflammatory activities rather than their antimicrobic action. It is recognized with increasing frequency, that patients who have both obstructive sleep apnea (OSA) and bronchial asthma, often improve tremendously when the sleep apnea is diagnosed and treated. CPAP is not effective in patients with nocturnal asthma only. If gastro-esophageal reflux disease is present, the patient may have repetitive episodes of acid aspiration, which results in airway inflammation and "irritant-induced" asthma. [पुष्टि(साइटेसन) मागु] GERD may be common in difficult-to-control asthma, but generally speaking, treating it does not seem to affect the asthma. The most effective treatment for asthma is identifying triggers, such as pets or aspirin, and limiting or eliminating exposure to them. Desensitization to allergens has been shown to be a treatment option for certain patients. As is common with respiratory disease, smoking adversely affects asthmatics in several ways, including an increased severity of symptoms, a more rapid decline of lung function, and decreased response to preventive medications. Asthmatics who smoke typically require additional medications to help control their disease. Furthermore, exposure of both non-smokers and smokers to second-hand smoke is detrimental, resulting in more severe asthma, more emergency room visits, and more asthma-related hospital admissions. Smoking cessation and avoidance of second-hand smoke is strongly encouraged in asthmatics. The specific medical treatment recommended to patients with asthma depends on the severity of their illness and the frequency of their symptoms. Specific treatments for asthma are broadly classified as relievers, preventers and emergency treatment. The Expert Panel Report 2: Guidelines for the Diagnosis and Management of Asthma (EPR-2) of the U.S. National Asthma Education and Prevention Program, and the British Guideline on the Management of Asthma are broadly used and supported by many doctors. A new draft Full Report of Expert Panel: Guidelines fo the Diagnosis and Management of Asthma (EPR-3) was posted on the NHLBI web site for public review and comment but has been withdrawn from the NIH website pending formal dissemination, although comments submitted by the American College of Allergy, Asthma and Immunology about the proposed revised NHLBI asthma guidelines are still available online. Bronchodilators are recommended for short-term relief in all patients. For those who experience occasional attacks, no other medication is needed. For those with mild persistent disease (more than two attacks a week), low-dose inhaled glucocorticoids or alternatively, an oral leukotriene modifier, a mast-cell stabilizer, or theophylline may be administered. For those who suffer daily attacks, a higher dose of glucocorticoid in conjunction with a long-acting inhaled β-2 agonist may be prescribed; alternatively, a leukotriene modifier or theophylline may substitute for the β-2 agonist. In severe asthmatics, oral glucocorticoids may be added to these treatments during severe attacks. For those in whom exercise can trigger an asthma attack (exercise-induced asthma), higher levels of ventilation and cold, dry air tend to exacerbate attacks. For this reason, activities in which a patient breathes large amounts of cold air, such as skiing and running, tend to be worse for asthmatics, whereas swimming in an indoor, heated pool, with warm, humid air, is less likely to provoke a response. Researchers at Harvard Medical School (HMS) have come up with convincing evidence that the answer to what causes asthma lies in a special type of natural "killer" cell. This finding means that physicians may not be treating asthma sufferers with the right kinds of drugs. For example, natural killer T cells seem to be resistant to the corticosteroids in widely used inhalers. A novel therapeutic target currently under investigation is the A2B receptor, a cell surface G-protein coupled receptor expressed in the lungs and in inflammatory cells expressed in asthma. Several animal models have confirmed the a critical role for A2B antagonists in pulmonary inflammation, fibrosis and airway remodelling. Symptomatic control of episodes of wheezing and shortness of breath is generally achieved with fast-acting bronchodilators. These are typically provided in pocket-sized, metered-dose inhalers (MDIs). In young sufferers, who may have difficulty with the coordination necessary to use inhalers, or those with a poor ability to hold their breath for 10 seconds after inhaler use (generally the elderly), an asthma spacer (see top image) is used. The spacer is a plastic cylinder that mixes the medication with air in a simple tube, making it easier for patients to receive a full dose of the drug and allows for the active agent to be dispersed into smaller, more fully inhaled bits. A nebulizer which provides a larger, continuous dose can also be used. Nebulizers work by vaporizing a dose of medication in a saline solution into a steady stream of foggy vapour, which the patient inhales continuously until the full dosage is administered. There is no clear evidence, however, that they are more effective than inhalers used with a spacer. Nebulizers may be helpful to some patients experiencing a severe attack. Such patients may not be able to inhale deeply, so regular inhalers may not deliver medication deeply into the lungs, even on repeated attempts. Since a nebulizer delivers the medication continuously, it is thought that the first few inhalations may relax the airways enough to allow the following inhalations to draw in more medication. Short-acting, selective beta2-adrenoceptor agonists, such as salbutamol (albuterol USAN), levalbuterol, terbutaline and bitolterol. Tremors, the major side effect, have been greatly reduced by inhaled delivery, which allows the drug to target the lungs specifically; oral and injected medications are delivered throughout the body. There may also be cardiac side effects at higher doses (due to Beta-1 agonist activity), such as elevated heart rate or blood pressure; with the advent of selective agents, these side effects have become less common. Patients must be cautioned against using these medicines too frequently, as with such use their efficacy may decline, producing desensitization resulting in an exacerbation of symptoms which may lead to refractory asthma and death. Older, less selective adrenergic agonists, such as inhaled epinephrine and ephedrine tablets, have also been used. Cardiac side effects occur with these agents at either similar or lesser rates to albuterol. When used solely as a relief medication, inhaled epinephrine has been shown to be an effective agent to terminate an acute asthmatic exacerbation. In emergencies, these drugs were sometimes administered by injection. Their use via injection has declined due to related adverse effects. Anticholinergic medications, such as ipratropium bromide may be used instead. They have no cardiac side effects and thus can be used in patients with heart disease; however, they take up to an hour to achieve their full effect and are not as powerful as the β2-adrenoreceptor agonists. Current treatment protocols recommend prevention medications such as an inhaled corticosteroid, which helps to suppress inflammation and reduces the swelling of the lining of the airways, in anyone who has frequent (greater than twice a week) need of relievers or who has severe symptoms. If symptoms persist, additional preventive drugs are added until the asthma is controlled. With the proper use of prevention drugs, asthmatics can avoid the complications that result from overuse of relief medications. Asthmatics sometimes stop taking their preventive medication when they feel fine and have no problems breathing. This often results in further attacks, and no long-term improvement. Preventive agents include the following. Inhaled glucocorticoids are the most widely used of the prevention medications and normally come as inhaler devices (ciclesonide, beclomethasone, budesonide, flunisolide, fluticasone, mometasone, and triamcinolone). Long-term use of corticosteroids can have many side effects including a redistribution of fat, increased appetite, blood glucose problems and weight gain. In particular high doses of steroids may cause osteoporosis. For this reasons inhaled steroids are generally used for prevention, as their smaller doses are targeted to the lungs unlike the higher doses of oral preparations. Nevertheless, patients on high doses of inhaled steroids may still require prophylactic treatment to prevent osteoporosis. Deposition of steroids in the mouth may cause a hoarse voice or oral thrush (due to decreased immunity). This may be minimised by rinsing the mouth with water after inhaler use, as well as by using a spacer which increases the amount of drug that reaches the lungs. Leukotriene modifiers (montelukast, zafirlukast, pranlukast, and zileuton). Mast cell stabilizers (cromoglicate (cromolyn), and nedocromil). Methylxanthines (theophylline and aminophylline), which are sometimes considered if sufficient control cannot be achieved with inhaled glucocorticoids and long-acting β-agonists alone. Antihistamines, often used to treat allergic symptoms that may underlie the chronic inflammation. In more severe cases, hyposensitization ("allergy shots") may be recommended. Omalizumab, an IgE blocker; this can help patients with severe allergic asthma that does not respond to other drugs. However, it is expensive and must be injected. Methotrexate is occasionally used in some difficult-to-treat patients. If chronic acid indigestion (GERD) contributes to a patient's asthma, it should also be treated, because it may prolong the respiratory problem. Additionally, the antidepressant tianeptine has shown significant efficacy in children with asthma. 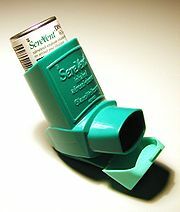 A typical inhaler, of Serevent (salmeterol), a long-acting bronchodilator. Long-acting bronchodilators (LABD) are similar in structure to short-acting selective beta2-adrenoceptor agonists, but have much longer sidechains resulting in a 12-hour effect, and are used to give a smoothed symptomatic relief (used morning and night). While patients report improved symptom control, these drugs do not replace the need for routine preventers, and their slow onset means the short-acting dilators may still be required. In November of 2005, the American FDA released a health advisory alerting the public to findings that show the use of long-acting β2-agonists could lead to a worsening of symptoms, and in some cases death. Currently available long-acting beta2-adrenoceptor agonists include salmeterol, formoterol, bambuterol, and sustained-release oral albuterol. Combinations of inhaled steroids and long-acting bronchodilators are becoming more widespread; the most common combination currently in use is fluticasone/salmeterol (Advair in the United States, and Seretide in the United Kingdom). "Salpeter and colleagues also assert that salmeterol may be responsible for 4000 of the 5000 asthma-related deaths that occur in the United States annually. However, when salmeterol was introduced in 1994, more than 5000 asthma-related deaths occurred per year. Since the peak of asthma deaths in 1996, salmeterol sales have increased about 5-fold, while overall asthma mortality rates have decreased by about 25%, despite a continued increase in asthma diagnoses. In fact, according to the most recent data from the National Center for Health Statistics, U.S. asthma mortality rates peaked in 1996 (with 5667 deaths) and have decreased steadily since. The last available data, from 2004, indicate that 3780 deaths occurred. Thus, the suggestion that a vast majority of asthma deaths could be attributable to LABA use is inconsistent with the facts." systemic steroids, oral or intravenous (prednisone, prednisolone, methylprednisolone, dexamethasone, or hydrocortisone). Some research has looked into an alternative inhaled route. intubation and mechanical ventilation, for patients in or approaching respiratory arrest. Many asthmatics, like those who suffer from other chronic disorders, use alternative treatments; surveys show that roughly 50% of asthma patients use some form of unconventional therapy. There are little data to support the effectiveness of most of these therapies. A Cochrane systematic review of acupuncture for asthma found no evidence of efficacy. A similar review of air ionisers found no evidence that they improve asthma symptoms or benefit lung function; this applied equally to positive and negative ion generators. A study of "manual therapies" for asthma, including osteopathic, chiropractic, physiotherapeutic and respiratory therapeutic manoeuvers, found there is insufficient evidence to support or refute their use in treating asthma; these manoeuvers include various osteopathic and chiropractic techniques to "increase movement in the rib cage and the spine to try and improve the working of the lungs and circulation"; chest tapping, shaking, vibration, and the use of "postures to help shift and cough up phlegm." On the other hand, one meta-analysis found that homeopathy has a potentially mild benefit in reducing symptom intensity; however, the number of patients involved in the analysis was small, and subsequent studies have not supported this finding. Several small trials have suggested some benefit from various yoga practices, ranging from integrated yoga programs —"yogasanas, Pranayama, meditation, and kriyas"—to sahaja yoga, a form of meditation. Ayurveda recommends use of herbs such as Ajwain, Harad, Hing, Ajamoda, Lavanga, Sunthi and others. The Buteyko method, a Russian therapy based on breathing exercises, has been investigated. A randomized, controlled trial of just 39 patients in 1998 showed a substantial reduction in the need for beta-agonists and a 50% reduction in the need for inhaled steroids. Lung function remained the same despite the decrease in medication. A trial in New Zealand in 2003 showed an 85% reduction in the use of beta-agonist medication and a 50% reduction in inhaled steroid use after six months. Given that some research has identified a negative association between helminth infection (hookworm) and asthma and hay fever, some have suggested that hookworm infestation, although not medically sanctioned, would cure asthma. There is anectdotal evidence to support this. Guaifenesin, an expectorant available over the counter, may have a small effect in managing thickened bronchial mucus. See also Complementary and alternative medicine. आज्माया प्रोग्नोसिस बांला, विशेषयाना माइल्ड ल्वय् दुगु मचातेत। मचाबिले डायग्नोसिस जुगु आज्माय् ५४%य् थ्व डायग्नोसिस १०दं धुंका दैमखु। आज्मातिक्सय् extent of permanent lung damage गुलि दु धका बांलाक्क जानकारी मदुनि। Airway remodelling खनेदै तर थुकिलिं म्हयात द्याइ वा त्याइ धका आतक्क धाय्‌ मछिं। Although conclusions from studies are mixed, most studies show that early treatment with glucocorticoids prevents or ameliorates decline in lung function as measured by several parameters. For those who continue to suffer from mild symptoms, corticosteroids can help most to live their lives with few disabilities. The mortality rate for asthma is low, with around 6000 deaths per year in a population of some 10 million patients in the United States. Better control of the condition may help prevent some of these deaths. The prevalence of childhood asthma has increased since 1980, especially in younger children. being female, for persistence of asthma into adulthood. There is a reduced occurrence of asthma in people who were breast-fed as babies. Current research suggests that the prevalence of childhood asthma has been increasing. According to the Centers for Disease Control and Prevention's National Health Interview Surveys, some 9% of US children below 18 years of age had asthma in 2001, compared with just 3.6% in 1980 (see figure). The World Health Organization (WHO) reports that some 8% of the Swiss population suffers from asthma today, compared with just 2% some 25–30 years ago. Although asthma is more common in affluent countries, it is by no means a problem restricted to the affluent; the WHO estimate that there are between 15 and 20 million asthmatics in India. In the U.S., urban residents, Hispanics, and African Americans are affected more than the population as a whole. Globally, asthma is responsible for around 180,000 deaths annually. On the remote South Atlantic island Tristan da Cunha, 50% of the population are asthmatics due to heredity transmission of a mutation in the gene CC16. The incidence of asthma is higher among low-income populations within a society (it is not more common in developed countries than developing countries), which in the western world are disproportionately minority, and more likely to live near industrial areas. Additionally, asthma has been strongly associated with the presence of cockroaches in living quarters, which is more likely in such neighborhoods. The quality of asthma treatment varies along racial lines, likely because many low-income people cannot afford health insurance and because there is still a correlation between class and race. For example, black Americans are less likely to receive outpatient treatment for asthma despite having a higher prevalence of the disease. They are much more likely to have emergency room visits or hospitalization for asthma, and are three times as likely to die from an asthma attack compared to whites. The prevalence of "severe persistent" asthma is also greater in low-income communities compared with communities with better access to treatment. Asthma appears to be more prevalent in athletes than in the general population. One survey of participants in the 1996 Summer Olympic Games, in Atlanta, Georgia, U.S., showed that 15% had been diagnosed with asthma, and that 10% were on asthma medication. These statistics have been questioned on at least two bases. Athletes with mild asthma may be more likely to be diagnosed with the condition than non-athletes, because even subtle symptoms may interfere with their performance and lead to pursuit of a diagnosis. It has also been suggested that some professional athletes who do not suffer from asthma claim to do so in order to obtain special permits to use certain performance-enhancing drugs. There appears to be a relatively high incidence of asthma in sports such as cycling, mountain biking, and long-distance running, and a relatively lower incidence in weightlifting and diving. It is unclear how much of these disparities are from the effects of training in the sport, and from self-selection of sports that may appear to minimize the triggering of asthma. In addition, there exists a variant of asthma called exercise-induced asthma that shares many features with allergic asthma. It may occur either independently, or concurrent with the latter. Exercise studies may be helpful in diagnosing and assessing this condition. ↑ ५.० ५.१ ५.२ McFadden ER, Jr. "Asthma". In Kasper DL, Fauci AS, Longo DL, et al (eds). Harrison's Principles of Internal Medicine, 16th ed., pp. 1508–1516. New York: McGraw-Hill;2004. ↑ Longmore, Murray et al (2007). Oxford Handbook of Clinical Medicine, 7th ed., Oxford University Press. ↑ Pinnock H, Shah R (2007). "Asthma". Br Med J 334 (7598): 847–50. DOI:10.1136/bmj.39140.634896.BE. ↑ Vargas, PA (September 2004). "Characteristics of children with asthma who are enrolled in a Head Start program". J Allergy Clin Immunol: 499–504. PMID 15356547. ↑ Szentivanyi, Andor (1968). "The Beta Adrenergic Theory of the Atopic Abnormality in Asthma". (1993) "50th Anniversary of the American Academy of Allergy and Immunology. 49th Annual Meeting. Chicago, Illinois, March 12–17, 1993. Abstracts.". J Allergy Clin Immunol 91 (1 Pt 2): 141–379. PMID 8421135. ↑ (2001) Kowalak JP, Hughes AS et al (eds) Professional Guide To Diseases, 7th ed., Springhouse. ↑ Ouellette, J. J.; C. E. Reed (March 1967). "The effect of partial beta adrenergic blockade on the bronchial response of hay fever subjects to ragweed aerosol.". Journal of Allergy 39 (3): 160-6. PubMed. ↑ Fraser, Claire M.; J. Craig Venter (May 14, 1980). "The synthesis of beta-adrenergic receptors in cultured human lung cells: induction by glucocorticoids." (PDF). Biochemical and Biophysical Research Communications 94 (1): 390–397. DOI:10.1016/S0006-291X(80)80233-6. PubMed. Retrieved on 2006-09-23. ↑ Asthma and Air Quality. ↑ California Children's Health Study. ↑ Terttu HH, Leinonen M, Nokso-Koivisto J, Korhonen T, Raty R, He Q, Hovi T, Mertsola J, Bloigu A, Rytila P, Saikku P (2006). "Non-random distribution of pathogenic bacteria and viruses in induced sputum or pharyngeal secretions of adults with stable asthma". Thorax. PMID 16517571. ↑ २२.० २२.१ Richeldi L, Ferrara G, Fabbri LM, Lasserson TJ, Gibson PG (2005). "Macrolides for chronic asthma". Cochrane Database Syst Rev (4): CD002997. PMID 16235309. ↑ Pasternack R, Huhtala H, Karjalainen J (2005). "Chlamydophila (Chlamydia) pneumoniae serology and asthma in adults: a longitudinal analysis". J Allergy Clin Immunol 116 (5): 1123–8. PMID 16275386. ↑ Ronchetti R, Biscione GL, Ronchetti F, Ronchetti MP, Martella S, Falasca C, Casini C, Barreto M, Villa MP (2005). "Why Chlamydia pneumoniae is associated with asthma and other chronic conditions? Suggestions from a survey in unselected 9 years old schoolchildren". Pediatr Allergy Immunol 16 (2): 145-50. PMID 15787872. ↑ Leggett, Julian J.; Brian T. Johnston, Moyra Mills, Jackie Gamble, and Liam G. Heaney (April 2005). "Prevalence of Gastroesophageal Reflux in Difficult Asthma". Chest 127 (4): 1227–1231. PubMed. Retrieved on 2006-09-23. ↑ American Journal of Respiratory and Critical Care Medicine 1995;151:969–74. ↑ Cromie, William J.. "Researchers uncover cause of asthma", Harvard University Gazette, Harvard News Office, 2006-03-16. Retrieved on 2006-09-23. ↑ D. Zeng & R. Polosa (2006). A Novel Therapeutic Target in Asthma - The A2B Adenosine Agonist. ↑ Serevent Diskus, Advair Diskus, and Foradil Information (Long Acting Beta Agonists) - Drug information. FDA (2006-03-03). ↑ Rodrigo G (2005). "Comparison of inhaled fluticasone with intravenous hydrocortisone in the treatment of adult acute asthma". Am J Respir Crit Care Med 171 (11): 1231–6. PMID 15764724. ↑ "Worm infestation 'beats asthma'", BBC News, 2001-11-02. ↑ National Heart, Lung, and Blood Institute (May 2004). Morbidity & Mortality: 2004 Chart Book On Cardiovascular, Lung, and Blood Diseases. National Institutes of Health. ↑ National Center for Health Statistics (07 April 2006). Asthma Prevalence, Health Care Use and Mortality, 2002. Centers for Disease Control and Prevention. National Heart, Lung, and Blood Institute — Asthma – U.S. NHLBI Information for Patients and the Public page. National Heart, Lung, and Blood Institute — Asthma – U.S. NHLBI Information for Health Professionals page. MedLinePlus: Asthma – a U.S. National Library of Medicine page. American Academy of Allergy, Asthma, and Immunology – a U.S. organization of medical professionals with a special interest in treating and researching conditions such as allergic rhinitis, asthma, atopic dermatitis/eczema, and anaphylaxis. Asthma and Allergy Foundation of America – national nonprofit patient advocacy organization with information about asthma. Asthma UK – a patient-oriented site with information on asthma and ways that UK residents can help improve asthma-related policy. Asthma Foundation of Queensland Information and education for Australian asthma sufferers. Case Studies in Environmental Medicine (CSEM): Environmental Triggers of Asthma – Agency for Toxic Substances and Disease Registry, U.S. Department of Health and Human Services. Asthma as Neurogenic Inflammatory Disease Neurogenic aspects of asthma. Pathophysiological links with other inflammatory disorders. India Asthma Care Society Easy to understand asthma information site for patients. The Segal Guide to Asthma by Michael Segal MD PhD. This page was last edited on १ अप्रिल २०१५, at ०६:०१.